For much of his career, Doell, 38, worked in the oil and gas sector, in quality control. His responsibilities revolved around making sure that the quality of manufactured pipes was up to industry and government standards. He enjoyed his work, but what he didn’t relish was how connected the oil and gas industry is to the global economy. When the economy was up, boy, did he have a lot of work. When it was down, um, not so much. He also didn’t love traveling for his business. It pulled him away from his wife, Sarah, and their four children. Which is how Doell found himself going into the cleaning business. Ah, you’re thinking. I’m reading this on the Stratus Building Solutions website. So now you’re going to tell us that he bought a Stratus Building Solutions franchise and became a successful business owner. Um, no. Well, not yet. About six or seven years ago, according to Doell, he and Sarah started earning extra money in the cleaning business. Sarah’s aunt and uncle owned a cleaning business, and when they wanted to go on vacation, the Doells did the cleaning for their clients that week. It allowed Sarah’s aunt and uncle to take a break and not lose clients, and it helped the Doells when the economy wasn’t faring well – and the extra cash was also appreciated when the economy was healthy. And then one day, Doell started helping a friend renovate his office building. The friend needed a lot of odd jobs done, like painting and plumbing, and Doell picked up some extra money by tackling those tasks. Then he noticed another way he might make even more revenue. “I started looking at the job the cleaners were doing, and I figured I could do a better job, and so I offered my services to him,” Doell recalls. Ah. So that’s when Doell bought a Stratus Buildings Solutions franchise and became a business owner. Doell kept his job in quality control, but in his spare time, he ran his cleaning company. And the more he ran it, the more he liked the idea of being his own business owner full-time. And so one day, Doell posted an ad on Kijiji, Canada’s number one classified ads site (for those who are unfamiliar with it, it’s kind of the American version of Craigslist). “I refer to it as putting a message in a bottle,” Doell says. He was looking for more accounts and hoping to build up his business. And about 90 days later, he received a phone call from Stuart Erskine, the CIO of Stratus Building Solutions. Ah ha! And then he bought a Stratus Building Solutions franchise and became a business owner. Well, that’s close. Erskine wanted to know if Doell would be interested in using his cleaning business knowhow and buying a Stratus Building Solutions franchise. And long story made short: Doell liked what he heard, and after he did his research, in August of 2018, he decided to open up a Stratus Building Solutions franchise, and…? It wasn’t an immediate transition from quality control guy in the oil industry to running his own business. 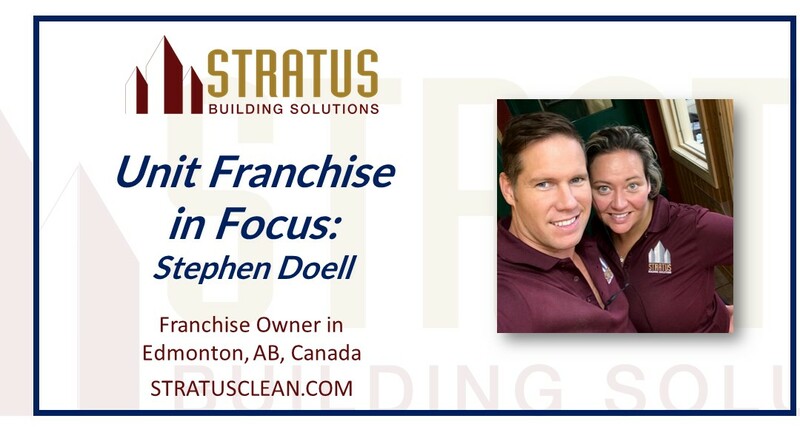 For starters, Doell had some clients with his part-time cleaning business, pre-Stratus, but not enough to support his family full-time – and just because he bought a Stratus Building Solutions franchise, that didn’t automatically give him a full roster of commercial cleaning clients. So, for the next several months, he didn’t quit his day job – and he ran Stratus for about four or five hours in the evenings. Not glamorous? Grueling? To be sure. But Doell believed his hard work would pay off. “Whatever cleaning job was offered to me, I took it,” he says. You have to spend some time figuring out everybody’s cleaning personality, in a sense, Doell explains. In December of 2018, he finally quit his oil and gas job and switched to Stratus full time. “We still didn’t have quite enough clients,” he says. “But we were busy enough that I knew I needed to put all of my time into one thing.” Plus, he wasn’t seeing his kids too much, except for his oldest, their 18-year-old daughter Katelyn who would sometimes come on cleaning gigs with her father and mother. Mostly, though, Doell has had a part-time cleaning crew helping him get things moving, and he has thoroughly enjoyed being his own boss. “I have control of my own destiny, and I like that,” he says. So, he envisions his Stratus Building Solutions growing into a far bigger company, one in which he could have teams of cleaning crews working under him? Well, he could do that, but, no. At some point, Doell says he’ll sell his Stratus Buildings Solution franchise. What? Already? C’mon. What sort of crazy inspirational story is this? It’s actually very inspiring. Doell thinks his message in a bottle has been answered – and then some. The Stratus corporate office was so impressed with him, they invited Doell to run the Edmonton, Alberta office. “Right now, we have 12 franchisees, including me,” Doell says. So what advice would he give people who are thinking of buying a franchise, whether Stratus or something else? He admits he still marvels at how that classified ad changed his life. He also is grateful that he picked up the phone when Erskine called. Are you ready to answer the call and begin your path towards entrepreneurship, just like Stephen? Does a unit franchise opportunity with Stratus Building Solutions sound like it could be right for you? Learn more about unit franchise opportunities in the United States and Canada at https://www.stratusclean.com/unit-franchise.